Our core philosophy when it comes to Organic SEO (Natural) Search Engine Optimization is very simple, Play By The Rules. 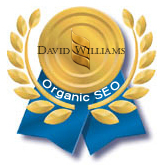 David Williams' approach to Natural Organic SEO (Search Engine Optimization) is 3-fold beginning with relevant copy writing for the searchers, understanding accepted techniques for the search engines and playing by the rules to deploy a search engine friendly website that serves the world wide web community as well as our clients. There are only three directions to choose from when performing Organic Search Engine Optimization (SEO). Left of Center - Trying to Write for Clients only. Right of Center - Trying to Write for the Search Engines only.